Now this is lovely. Were it nearer the centre of town, far more people would have heard of it. Were it nearer easier to get to, far more people like you would have visited. But instead this 'Tudor house and gardens' combo feels like Bexley's cosy little secret. Thank goodness hundreds of locals are well aware of Hall Place's charms, because the car park was chock-full on Saturday. First up, through the stone archway, it looks like you've stumbled into a garden centre. 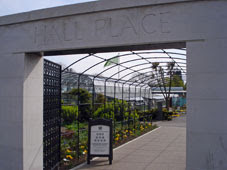 One of the greenhouses hosts a nursery shop, to be sure, but there's also a sub-tropical plant house with a central display of resplendent foliage [photo]. It smells great too, with that special spring whiff of daffodil and hyacinth, courtesy of a seasonal perimeter filled entirely with temporary flowerpots. Outside are an extensive fruit garden plus herbaceous beds, not yet anywhere near their best, but on their way. And that's just the start. The grounds are extensive, 65 acres in total, which is easily large enough for a picnic or to get lost. The River Cray meanders through the middle [photo], with a heather garden and spring meadow somewhere on the far side if you look hard enough. Most of the interesting stuff, however, is closer at hand. The visitor centre was opened only recently, courtesy of a substantial Heritage Lottery grant, although the collection of small gifts, information leaflets and ice cream could easily have been crammed into a substantially smaller space. Off to one side the old stable block makes a very pleasant art gallery, but it's the riverside Tea Room which appears to be the biggest hit. Packed out, it was, mostly with 40-plus ladies or near-retired couples enjoying a pot and light snack in the early spring almost-sunshine. Onward, through to the house and formal gardens. 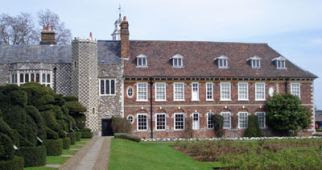 Hall Place is in two halves, melded together, and that brick frontage is the Jacobean later half [photo]. Round the back, which is actually the front, is the fine Tudor mansion built for Lord Mayor of London Sir John Champneys in 1537. It boasts black and white chequerboard walls, plus a prominent side-turret, and is best viewed from the main road. The house's dividing line, extended across the lawn, is marked by a row of sculpted green 'chess pieces'. These are the Queen's Beasts, a most magnificent topiary display featuring heraldic creatures such as The Unicorn of Scotland and The Falcon of the Plantagenets [photo]. Once the lower rose garden bursts into bloom in a few months time, there'll be no finer view for miles. To top it off, yes, of course you can take a look inside the building. A series of displays, recently updated, recount the turbulent social history of the house. There are several rooms to explore, both old and very old, including the lofty Great Hall with its Minstrels Gallery. The building doubles up as Bexley's borough museum, so there's the usual haul of prehistoric finds, historic artefacts and wartime ephemera. One room, with a nod to Hall Place's lucrative wedding-hire package, has been given over to bridal dresses and brochures for society weddings. Another is hosting a year-long exhibition entitled Sound and Vision, which is heaven if you like crystal wirelesses, old TV sets and 1950s radiograms. And all this is free, courtesy of a non-profit-making council spinoff called the Bexley Heritage Trust. They fund seven full-time gardeners to maintain the grounds in tip-top shape, while an army of volunteers are used to keep the whole place ticking over. I can't think of any other London council with a facility quite like Hall Place, so all credit to Bexley for a little touch of municipal brilliance.